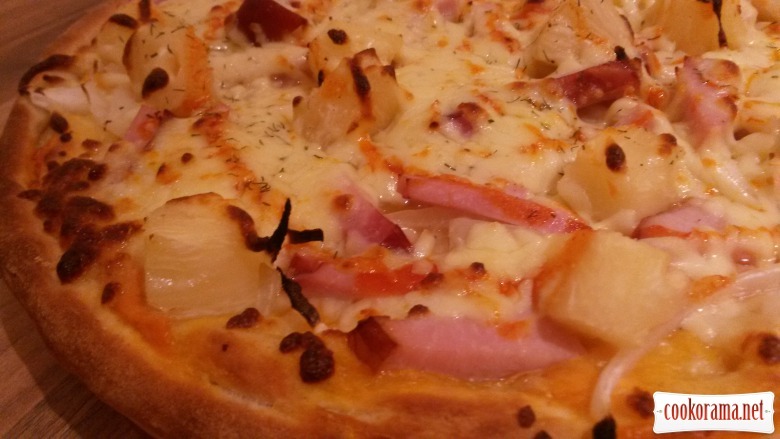 Plus extremely crispy pizza basis in can be taken a variety of toppings (salami, olives, mozzarella, tuna, capers, seafood, anchovies, pepperoni, even sweet, then that what to whom tastes). Roll out on the table, poured a little with flour, twisting on the rolling pin, spread on baking sheet (slightly grease with oil) for pizza. (sometimes on the edge of dough, I pour a little grated cheese and wrap the seam, so when pizza bakes — it`ll be with with cheese «border» ). Smear dough with a mixture of tomato puree and sour cream (or mayonnaise ), grate a bit of cheese, evenly distributing it, then put chopped onion, strips of ham and pineapple cubes (previously well drained from liquid), grate the rest of the cheese on top, sprinkle with chopped fresh herbs and in a hot oven (for pizza turn to the maximum, I baked with convector at 220 ℃). Cooking time about 15 minutes (depending on oven type), for which I once turn on pizza pan to bake evenly from all sides (and you see due to your oven). 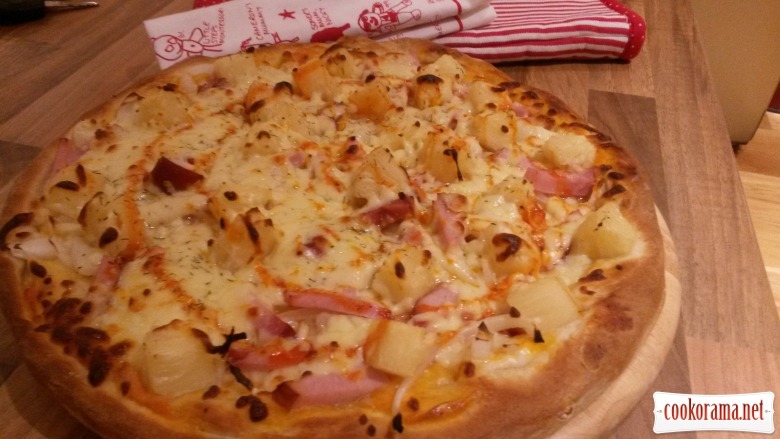 Top of recipe "Crispy pizza with ham and pineapple (+ dough recipe that does not require time for "growing")"